U.S. and allied commanders in Afghanistan are preparing for the biggest battle of the eight-year war, knowing that its outcome will reveal the chances of success for President Obama's revamped Afghan strategy. About 20,000 U.S., British and Afghan troops will soon storm Marja, the Taliban's final redoubt in the southern province of Helmand. A town of 80,000, Marja has for years been a den of narcotics traffickers and insurgents, serving as a launching pad for roadside bombs and suicide attacks. If the U.S. and its allies succeed in driving out the Taliban  and, perhaps more importantly, bring a measure of security to Marja  U.S. officials believe it will mark a turning point in the war. The battle has actually been under way for several weeks, as Afghan and Western forces have announced their plans to the local population while moving into position. Pentagon officials say this unusually public "shaping" of the battlefield has one key goal: while hundreds of hard-core Taliban are hunkering down for a fight, many more, along with thousands of residents, have fled Marja until the dust settles. That should limit civilian casualties and, they hope, lure some lukewarm Taliban over to the government side. "We're not interested in how many Taliban we kill," Army General Stanley McChrystal, the top U.S., commander in Afghanistan, said Thursday. "We'd much rather have them see the inevitability that things are changing and just accept that." But U.S. and Afghan officials know that die-hard Taliban forces have been burying hundreds of improvised explosive devices around the town in recent weeks. "It's giving time and space to those who want to fight to dig in," says Ali Jalali, who served as Afghanistan's first post-Taliban Interior Minister and now works with the Pentagon's National Defense University in Washington. "It could be very bloody, and that could affect public opinion in Europe and the U.S."
The effort to roll up Marja follows last summer's sweep through much of Helmand, which drove many additional Taliban into the town. While there weren't enough troops to take the town at that time, the growing ranks of Afghan security forces and some of the additional 30,000 U.S. troops ordered to Afghanistan by Obama in December have given commanders the ability to storm Marja, U.S. officers say. While last year's offensive was largely a U.S.-led affair, this time Afghan forces will account for about half of the troops involved. Operation Moshtarak  "Together" in the Afghan Dari language  is meant to signal growing cooperation between Afghan and foreign forces, and the Afghans' ability to shoulder more of the burden of defending their country. "The Afghan forces all have Marine haircuts right now," McChrystal noted of the local troops preparing to storm the town alongside U.S. Marines. The offensive, when it begins in earnest, will largely be conducted on foot. That's because the terrain surrounding Marja is latticed with canals built by the U.S. a generation ago to expand agriculture to 250,000 acres in the Helmand River valley. It also gave the region the nickname "Little America." The canals and ditches created a network of bridges unable to support armored vehicles and gives the Taliban good places to hide IEDs  the top killer of U.S. troops in Afghanistan  and snipers. They also turned the region into lush farmland that has proven ideal for growing opium-producing poppies. Both sides predict the fight for Marja could be brutal, with belts of IEDs believed to be buried along all major approaches to the town. Unlike earlier battles over towns and villages further east, where many Taliban are from Pakistan, the enemy in Marja is largely local, which will further complicate the fight. "It's harder to separate the enemy from the people," a Pentagon planner says, "when they are the people." But it's what follows the fighting that will be the real test. While many in Marja detest the Taliban, they are just as angry at the impotence of the Afghan government to better their lives despite years of promises. U.S. officials say Afghan President Hamid Karzai, some 500 miles from Marja in Kabul, has become a full partner in the planning of the offensive and its follow-up development efforts. Afghan and U.S. experts will flood Marja after the offensive, helping to set up local government and schools, and offering cash to entice poppy growers to shift to wheat. After driving the Taliban out, Afghan and allied troops plan on staying in Marja to ensure its security. The Taliban will have little recourse once the offensive begins. Instead of fighting to the death, U.S. officials believe some of them will melt into the local population to fight another day, while others will flee to fight elsewhere. As McChrystal prepares to launch the offensive, he's got one eye on Marja and the other on the calendar. If he and his forces prevail, it will serve as the template for the far more challenging battle this summer for the Taliban capital of Kandahar, about 100 miles to the east. Success in Kandahar, Afghanistan's second largest city, would mean that McChrystal is on track to achieving Obama's ultimate goal: to start sending U.S. troops back home in July 2011. 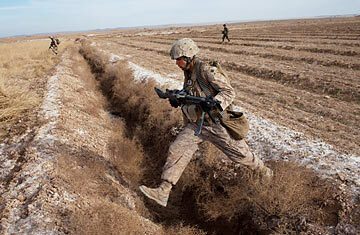 Watch TIME's video "The Challenge on the Ground in Afghanistan." Read "Paying for the Afghan War."